Rômulo Barral quickly submits Denis Roberts with a footlock. Werdum submits Roger Lorent with a kimura from north&south. Saulo quickly jumps to halfguard against the much bigger Koji Kanechika working for the sweep. Gets it and passes the guard fast. After a long fight on the feet Thomasewski Janisz submits Antoine Jaoude with a rear naked choke after a long fight mostly on their feet. Saulo Ribeiro beats Koji by judges decision. Monsen jumps to halfguard and sweeps Karol Bedorf. Janne Pekka Pietelainen quickly submits Tom Erickson with an inverted heelhook. Monson beats Bedorf by points. Roberto Abreu (Cyborg) working from his guard, trying to catch Tom DeBlass with triangles and sweeps but DeBlass looks very stable and calm. Asa Fuller submits Mike Martell with an armbar from mount. Cyborg almost gets guillotined by Tom de Blass. Cyborg escapes and wins by points. Radek Turek sinks a triangle and taps Rafael Davis with an armbar from the triangle. Xande sweeps Ilir Latifi. Vinicius Magalheas submits Rodrigo Henriques quickly with a heelhook. Xande beats Latifi by points. Dean Lister jumps to guard and sinks a triangle on Andreas Olsen which forces him to tap. Perosh works to pass Pe de Panos halfguard. Perosh shoots and Pe de Pano spins for the back. Pe de Pano then quickly submits Perosh from the back. Glover Teixera passes the guard of what looks like a much bigger Vesa Vouri and wins by points. Ricco Rodrigues is having a lot of problems against Tomasz Szczerek. Ricco is going for takedowns but doesnt get them. Ricco loses. Rinaldi beats Yoshiyuki by points. Galvão totally dominates Kassim Annan in the first minutes of the fight. But Kassim hangs in there bravely, reverses and almost passes the guard of Galvão. Galvão gets another takedown and wins by points. Galvão had to fight hard for that win. Cris Weidman beats Dan Tabera by points. Bráulio takes down Yuji Arai, takes his back and submits him with a rear naked choke. Trond Saksenvik jumps to guard against David Avellan, who tries to pass. Avellan gets the the tap with a footlock. Tarsis jumps to guard against a huge Igor Praporshchikov. Lovato jumps to guard against Tom Lawlor. Tarsis is having a lot of trouble with Igor who looks very stable on top. Lovato attacks with a heelhook but gets the sweep. Lovato wins by points. Tarsis wins on a judges decision being more active from below. Marcelo Garcia jumps to guard against Rodney Ellis and sweeps immediately. Passes the guard, mounts and taps him with a guillotine from the mount in under two minutes. Bastos tries to sweep Jorge Santiago from halfguard. Brasco beats Gunnar Nelson on overtime in a very even fight. Kron Gracie having trouble in the guard of Enrico Cocco, escaping Coccos constant leglock attacks. Santiago works on a kimura from top position as time runs out but Bastos wins by points. Azavedo passes the guard of Mike Fowler and gets sweeped just afterwards. Azevedo goes for a footlock and gets it. Kron gets the back of Cocco and submits him with a rear naked choke. Milton Viera jumps to guard against Nakamura. Popovich gets a takedown right away, gets the back and submits with a rear naked choke. Milton Viera works for the sweep, but the japanese is stable on top. Ben Askren works to pass the flexible guard of Toni Linden. Askren finally manages to pass to north&south, then mounts and gets sidechoke. Nakamura gets Vieras back and advances. Leo Santos jumps to guard on Yoshiyuki Yoshida and sweeps. Working for the pass. Getting the pass and then the back. Rani Yahya submits Kouhel Yasumi pretty fast. Leo Santos wins. Murilo Santana, winner of the brazilian qualifier jumps to guard, Gregor Gracie on top, trying to pass. Jeff Glover gets a choke on Timo Juhani in less then a minute. Rubens Charles (Cobrinha) jumps to guard on Hiroshi Nakamura, working for the sweep. The World class surfer Joel Tudor jumps to guard with Renier Nicolas on top. Cobrinha gets the back of Nakamura and after a scramble gets a beautiful armbar. Gregor almost passes the guard of Murilo Santana. Gregor almost gets a takedown. Tudor submits Nicolas with a triangle, repeating what he did to favorite Rani Yahya some weeks ago with the gi, showing that he is top level competitor in more then one sport. Gregor Gracie passes the guard of Santana. Leo Viera gets a takedown on David Marinakis. Gregor gets the back of Santana and wins by points as time runs out. Leo Viera submits Marinakis with a guillotine. Rafael Mendes sinks a triangle, tapping Jayson Patino pretty fast. Baret Yoshida and Justin Rader enters into a leglock war. Yoshida on the bottom with Rader in his guard. Ryan Hall beats Jeff Curran by points after a long fight that went into overtime. Rader now passes the guard of Yoshida. Scramble. Both get back to their feet. Baret initiates a takedown but ends up on his back. Rader gets another takedown and gets the win by points. Womens division starting. Hanette Stack submits japanese Hitomi Haraiwa with an armbar. Cyborg, the female vesion, submits Ida Hanson with an armbar in overtime. Veteran Megumi Fuji goes for a nice flying armbar, but doesnt get it. Her oppponent, Hillary Williams, looks really strong. Hillary gets the back of Fuji and submits with a rearnaked choke. Luanna Alzuguir sweeps, passes and submits Ina Stefensen with a guillotine. Sayaka Shioda beats Bianca Andrade due to minuspoints. 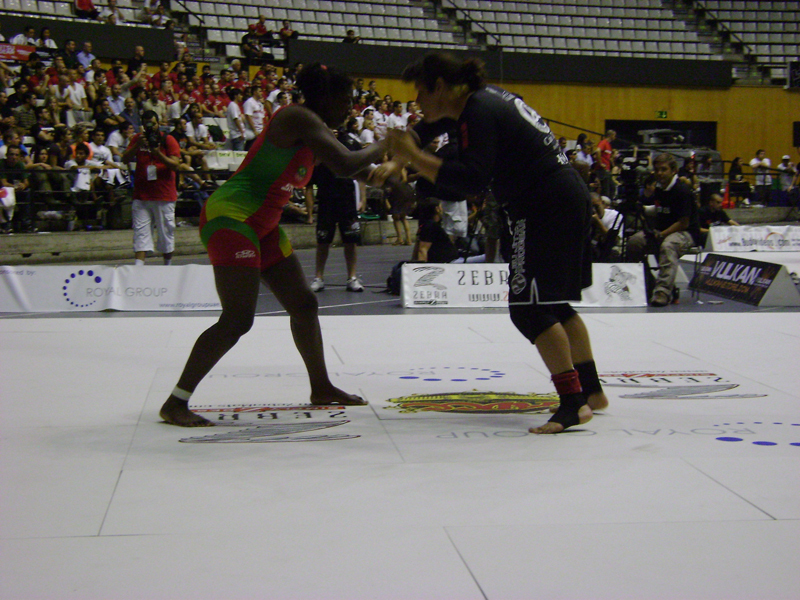 Penny Thomas beats Shanti Abelha. Rosangela beats the huge Lana Stephanac after a tough and long fight mostly on their feet. Laurence Cousin beats Ana Michelle Dantas. Mens quarterfinals start. Werdum pulls guard against Thomazs. Janne-Pekka Pietelainen pulls halfguard against Monson. Werdum sweeps and working to pass. Gets the back of Thomazs. Romulo Barral jumps to guard against Saulo. Saulo working to pass. Werdum wins by points. Saulo almost passing the guard of Barral. Janne-Pekka almost gets sweep on Monson, that has to run of the mat to defend the sweep. Saulo wins by points and advances to the semifinals. Monson couldnt pass the guard of Janne-Pekka, but wins due to one minus point. Vinícius Magalhães wins with a beautiful flying armbar on Pé-de-Pano, maybe the fastest submission so far in the tournament. Lister sweeps Glover Teixera from halfguard. Cyborg totally dominates his opponent Asa Fuller on the ground. Cyborg wins by points. Dean Lister almost has the back of Teixera but looks more and more tired. Lister is now loosing. Xande beats Radek Turek. Glover Teixera beats Lister, who looks really disappointed. Galvão gets a beautiful omoplata sweep on Chris Weidman, switches to an armbar, but Weidman defends well and gets out. Tarsis jumps to David Avellans guard. Galvão fights to get a sweep from the halfguard. After a scramble Avellan gets the back of Tarsis and submits him with a rear naked choke with only one arm. Rinaldi beats Tomazs Szczerek with an anaconda choke. Weidman almost submits Galvão with an anaconda choke from the top. Puts a lot of pressure on Galvão, who is starting to look really tired. Braulio Estima pulls guard with James Brasco on top. The fight between Galvão and Weidman goes into overtime. Lovato pulls guard on Bastos. Galvão almost gets a takedown but lands on the bottom. Galvão sweeps and gets the back, attacking the arm. Weidman gets out again. Galvao gets another sweep. Galvão wins by points after a really tough fight. Kron Gracie vs Marcelo Garcia. The whole arena is cheering and chanting. Garcia jumps guard. Bastos almost gets takedown. Estima wins. Lovato on Bastos back. Azevedo jumps to guard and sweeps Nakamura. Kron working to pass Garcia’s guard as Garcia looks for sweeps. Lovato gets takedown on Bastos. Garcia almost gets a sweep but Kron sweeps back. Kron goes for guillotine and Garcia passes to sidemount with the head still locked inside the guillotine. Lovato beats Bastos on points. Garcia frees his head and almost passes the guard of Kron but doesn’t manage to establish position. Popovich jumps guard on Askren and quickly submits him with a figure four footlock. Garcia gets a takedown but stuck in guillotine again. Garcia gets out. Scramble. Kron is all of a sudden on Garcias back, but no hooks in. Times up, no points awarded so fight goes into overtime. Garcia gets early takedown and working to pass. Nakamura beats Azevedo. Marcelo “Marcelinho” Garcia passes and submits Kron with a guillotine from the mount. The whole arena is standing up, clapping their hands due to the great fight between Kron and Garcia. Cobrinha gets Tudors back. Glover sweeps Rani. Rani sweeps back and passes guard. Cobrinha submits with a rear naked choke. Gregor Gracie beats Leo Santos after a tough fight. Leo Viera in Ryan Halls guard. Ryan with his flexible guard almost gets a triangle. Rafael Mendes gets a fast anaconda choke on Rader. Rani beats Jeff Glover by points . Leo Viera is having alot of trouble passing the guard of Ryan Hall. Fight goes into overtime. Ryan Hall jumps to guard again. Leo passes guard but cannot establish position. Ryan rolls to all four, Vieira on his back. Scramble. Back to thier feet. Leo Vieira gets a tight guillotine and Ryan Hall is forced to tap! Jacare vs Drysdale superfight! Jacaré gets takedown directly. Fight goes back to feet. Jacaré gets takedown again. Jacaré in Drysdales halfguard but cant pass. Back to feet again. Jacaré gets another takedown. Jacaré almost gets the pass this time. Drysdale retains guard. And back to feet again. Jacare gets a beautiful foot sweep, but nothing really happens as the fight hits the ground. Back to their feet. Drysdale being on the defense and a bit passive. Jacaré gets another inside sweep takedown, but they land outside the mats. Restart. Jacaré gets another takedown outside of the mats. Drysdale now goes for takedown, gets Jacaré back but falls to floor. Jacaré almost passing. Back on their feet. Little action. Drysdale goes for takedown again, gets reversed. Jacaré in Drysdales guard. Drysdale goes for sweep but doesnt get it. Back to their feet. Drysdale shoots, Jacaré sprawls. Same thing again. Now Drysdale more active. Jacaré wins by points due to a takedown. Leo is a veteran champion. Having started jiu-jitsu under Romero “Jacaré” ­Cavalcanti, Vieira has seen unprecedented success both in gi, no-gi and submission fighting tournaments. He’s known for his good humour and creative style. Back in 2000 Leo showed his potencial to the world while fighting with Mark Kerr in the ADCC. Now he is a multiple BJJ and ADCC champion known for his slick skills. Vieira’s fights shows such a level of dynamic jiu-jitsu that they become something really exciting to watch, even for laymen. He is 1 – 1 against Rani Yahya. He won in 2005 and lost in 2007. We hope they meet again this year and check who’s the best fighter below 66 Kg in the world. Leo and his brother run their own academy in California. He’s a perfectionist instructor, having formed many black-belts and instructing black-belts from other places. Vieira is also recognized as an excellent coach for competitions because of his deep knowledge of strategy. Brazilian/american jiu-jitsu black belt Robert Drysdale has been training and competing in BJJ since 1998. Robert was born in the USA and then moved to Brazil with his family at the age of six. As a teenager Robert returned to the USA to attend college in Las Vegas. There he began training with the Luis Pederneiras (Nova União) association. It was quickly evident that Drysdale was a natural at brazilian jiu-jitsu. It was during that time in Las Vegas that Robert decided he would dedicate himself fully to the training, competing, and teaching the art of brazilian jiu-jitsu. Robert returned to Brazil in 2000 where he lived until 2008. During that eight year period Robert Drysdale owned and operated a jiu-jitsu academy in the town of Itu, São Paulo, Brazil. While in São Paulo Robert trained with the Maromba Club and later with team Brasa Jiu-Jitsu Club. His personal commitment to teaching, training, and competing at the sports highest level was absolute. He trained several times per week with his fellow teammates at Brasa Jiu-jitsu club headquartered in downtown São Paulo. This elite team of world-class brazilian jiu-jitsu fighters is composed of some of the best black belts in the world. It was at Brasa in 2004 Robert received his black belt from Leo Viera. In 2008 Robert relocated to the USA and is currently teaching and training in the city of Las Vegas, Nevada. He is currently training with former UFC Champion, Randy Couture and former Pride Champion Wanderlei Silva. Robert Drydale recently made his amateur MMA debut with Tuff-N-Uff, winning by armbar in the first round against Josh Musick. Now he’s going to face Roger Gracie in a special match called Superfight. The last time they fought was in the finals of 2007 BJJ World Championship. Gracie won in a funny episode where he ripped Drysdale’s kimono. Drysdale runs a martial arts school in Las Vegas, Nevada. Watch his best videos here. The ADCC Barcelona 2009 is an event that can change the history of the fight events in Europe, this event is the most important fight tournament ever done in Spain, with the best team of fighters ever assembled in Europe. The Abu Dhabi Combat Club World Championship is organized each 2 years.